Microsoft Canada held their annual Xbox event last night at the Uniun Nightclub in Toronto. Titled X14 for this year, over 20 games were available on the show floor for fans to try out. 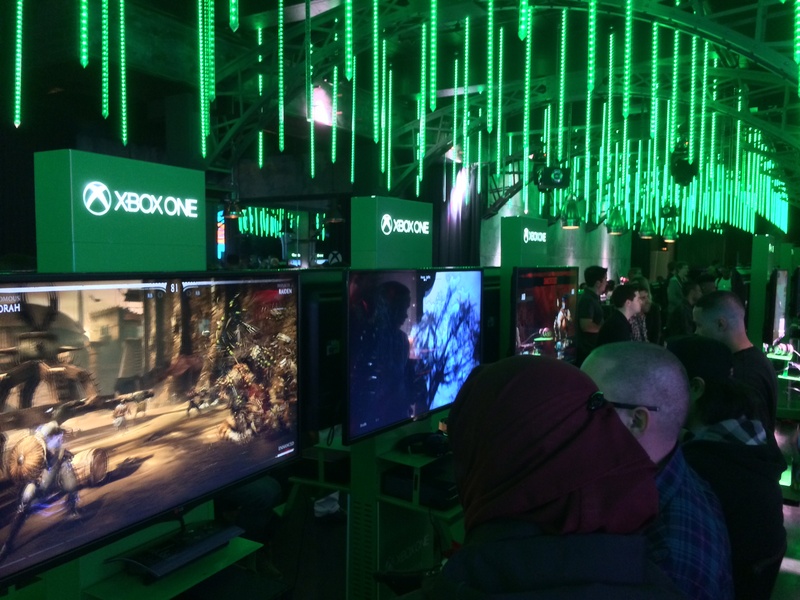 Big holiday titles such as Halo: The Master Chief Collection, Sunset Overdrive, and Forza Horizon 2 were all present with large demo stations. Call of Duty: Advanced Warfare was found behind closed curtains but only a video was being shown. I was surprised to see the limited availability, considering they had a full multiplayer demo at Fan Expo. A few new games were playable including Dying Light, Shape Up!, and Disney Infinity 2.0. Assassin’s Creed Unity was there as well. I would have to say out of all the games on the floor, the biggest surprise was Mortal Kombat X. It was completely unexpected to see this game playable, let alone even being shown, as it is set to release in April 2015. Four new and four classic characters were available to try out. Sub-Zero, Scorpion, Kano, and Raiden joined the new set comprised of Cassie Cage, D’Vorah, Kotal Kahn, and Ferra & Tor. The four arena options showcased destructible environments and organic backgrounds. During the character selection, one of three different fighting styles can be chosen and also comes with it’s own costume variation. This adds depth for those who wish to master a character’s specific skill set. The event was 3 hours long, but felt as if it went by after only a few minutes. I met a lot of great people including Kiesey78, NorthernZoot, and JohnnyXeo from the XboxPlayDatesCA team. They host amazing events that bring local gamers together to play new titles such as Titanfall, Minecraft, and Destiny. Head on over to the official site and register to participate in these great event nights. A special thanks goes out to the whole Xbox Canada team including Nicole, Raj, Cara, and Jeff for inviting me, and I look forward to attending future Xbox events.